It is not easy to sell the concept of sharing to a toddler. The idea of handing over a prized possession to another child is not an appealing one. Initially, a toddler is likely to be very protective of his toys and unwilling to share. This is because a toddler does not understand that the other child is only borrowing the toy and will give it back. Instead, the toddler will view handing over a toy to another child as giving it away permanently, and so, quite understandably, will be upset. If a toddler has a tantrum when forced to share toys, all he is doing is trying to protect what he believes is rightfully his. Changing this perception can be difficult and, for a while, playtimes can end in tears as a result. But with perseverance, a toddler will learn to share and develop a respect for other children. He will become more sensitive to the needs of others and more responsible. It is important for a stay-at-home dad to make a toddler’s first experience of sharing as painless as possible. A lot of children are introduced to the concept of sharing by being told to hand over a special toy to a stranger with no recompense and this can be upsetting. Instead, demonstrate that sharing as a two-way street and explain that sharing means the toddler gets to borrow other people’s things too. If there is a special toy that two or more children want to play with, encourage the children to take turns. A toddler will be less reluctant to hand the toy over in future if he knows he will get to play with it again in a short while. When explaining how sharing works, a househusband can show that adults share too. A good way to demonstrate this is by borrowing something from a friend or, if a neighbour calls to borrow an item, highlight this and later show the child that the item has been returned. Try to prepare meals that the whole family can share, as this too can help a toddler accept to the idea. Contact with other children is the key to building a child’s social skills, so it is important to get out and about and allow the toddler to socialise. If a child sees his dad interacting happily with friends, it will encourage him to seek out others for company. 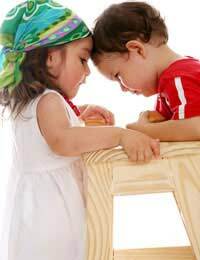 Children up to the age of two-and-a-half years tend not to play together in the way older children do. Instead, they will play alongside one other, with minimal interaction. As a toddler approaches three, he will start to interact more with other children in games and activities. This is when true social skills start to develop. When a dad knows another child will be visiting, he should take time to discuss this with his toddler. Get the child to agree on which toys he will be happy to share and hide the others away. Do not make the decision for the toddler. After all, they are his toys and he should have a say in what happens to them.